The choice for December’s “Reading and Refreshments” was easy: A Christmas Carol. Ever since we bought our first copy of Dickens’ classic twelve years ago, it has been our family tradition to read aloud one chapter on each of the four nights leading up to Christmas, and then the final chapter on Christmas morning. It’s a lovely holiday practice. Every year the pleasure of reading the story grows. Dickens captures the joyfulness of the Christmas season with a brilliancy that will probably never be equaled. They stood in the city streets on Christmas morning, where people made a rough music scraping the snow from the pavement in front of their dwellings … the people who were shoveling away on the housetops were jovial and full of glee, calling out to one another. The poulterers’ shops were still half open, and the fruiterers’ were radiant in their glory. The story and cast of characters are timeless—who can forget the penny-pinching, self-centered Scrooge, tenderhearted Tiny Tim, the mysterious Ghost of Christmas Future, or jolly Ghost of Christmas Present? Scrooge has ingrained himself into our cultural conscience so deeply that we still call a grouchy person a “Scrooge”—although Scrooge himself becomes quite the opposite by the end of the story! He became as good a friend, as good a master, and as good a man as the good old city knew. Some people laughed to see the alteration in him, but he let them laugh, and little heeded them. His own heart laughed, and that was quite enough for him. Choosing a refreshment from the many tantalizing festive dishes described by Dickens was a harder task. But ultimately we decided to follow the example of the merry revelers at Mr. Fezziwig’s party, and bake up some mince tarts. There were more dances, and they dined on cakes and roasts and mince pies, and they drank more then plenty of beer. Tonight we will once again start reading the classic story, and we hope that you will feel inspired to start a similar tradition in your family. Make the crust first: combine the flour and salt in a medium bowl, and cut in the cold butter until pieces the size of peas remain. Pour the cold water over the flour, and stir lightly with a fork until the dough starts to come together. Turn the dough out onto a lightly floured surface and work it into a disc. Wrap the disc in plastic wrap and chill it for a few hours or overnight. To make the filling, peel, core, and dice the apples. Place them in a large saucepan along with the raisins, orange juice, and cider. Bring to a simmer over medium heat and cook, stirring occasionally, until the apples are tender, about 20 minutes. Stir the granulated and brown sugars, spices, and crushed graham cracker into the fruit. Turn up the heat and boil the mixture for a few minutes to reduce the liquid to a syrup. Set aside to cool. For the topping, combine the granulated sugar, flour, and crushed graham cracker in a small bowl. Then work the cubed butter in with your fingertips until the mixture resembles wet sand and is beginning to clump together. Set aside. Remove the chilled pie dough from the refrigerator and place it on a well-floured counter. Roll out ⅛ -inch thick. Cut the dough into eight 4 ½-inch rounds. Take eight 4-inch fluted tart pans, preferably ones with removable bottoms, and line them with the rounds of dough. Place the prepared tart shells on a parchment-lined baking sheet, and transfer them to the refrigerator to chill for 15 to 20 minutes. 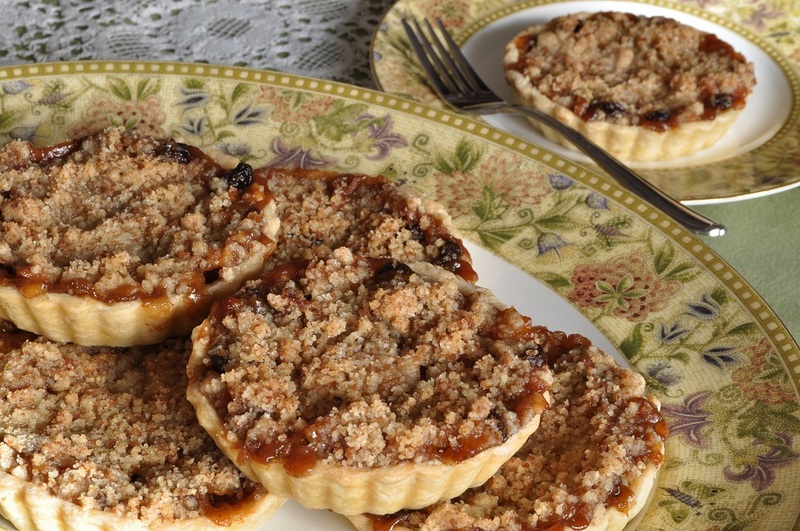 Remove the chilled tart shells from the refrigerator, and divide the apple-and-raisin filling equally among them. Sprinkle the topping evenly over the filling in the tarts. Bake for 15 minutes, and then reduce the oven temperature to 350°F. Continue baking until the filling is bubbling and the crust is golden, another 25 to 30 minutes. 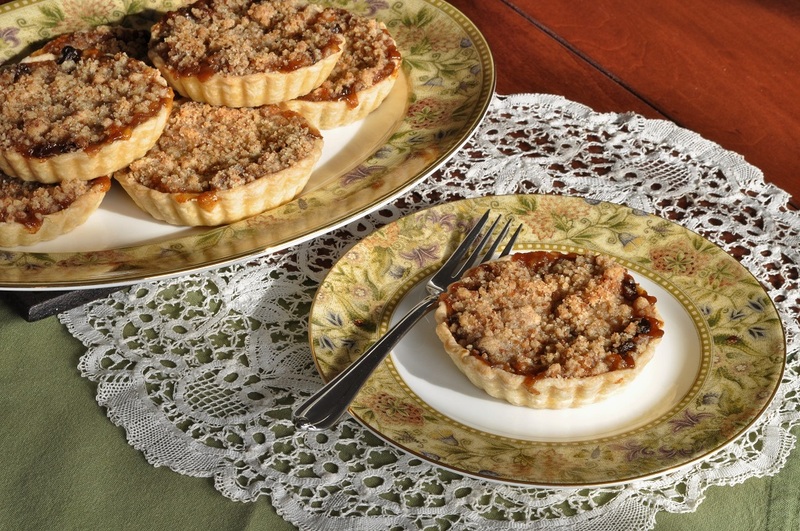 Remove the baking sheet from the oven, and transfer the tarts to a wire rack to cool. Once the tarts have cooled enough to handle, lift them out of the pans. Serve warm or at room temperature. Note: All quotations from A Christmas Carol were taken from the retelling by Jane Parker Resnick.